I only choose to work with brands and companies I believe in. This is possibly the first year I’ve ever been excited for Christmas. Maybe it’s that I’m finally happy and not feeling jaded to the point where I despise the obnoxiously cheerful decorations and Christmas music. All the ads for Christmas shopping and mall people aren’t even getting to me that much. We’re not really doing a lot of gifting this year for our families either. Don’t get me wrong, I love buying for other people and I like receiving gifts, but I also feel uncomfortable with them for some reason. I don’t know what it is, but I would rather just spend time with people rather than receive a gift. But I think my favourite part of the holidays is the food. Food can be fleeting, but I feel like everyone appreciates some good food and drink. Decadent, sweet, rich or savoury, sometimes people enjoy something more of the alcoholic nature. Around this time of year, everyone’s pulling out wine and mixed drinks at the holiday party, but I don’t really drink. I think the last drink I had was for a YouTube video and even then I lost interest in the wine and just added it to my pan for flavour. For parties, people make punch or signature cocktails, but I don’t like leaving anyone forgotten. The underage folks, the designated drivers, or people like me who just don’t want to drink; we need something tasty and fun too. Plus at a party where you only know a handful of people, sometimes it feels safe to have a drink in your hand to sip on when you don’t know what to say. Festive drinks tend to be warm, full of nutmeg and cinnamon, creamy and rich, but I like to think that watermelon is festive too. 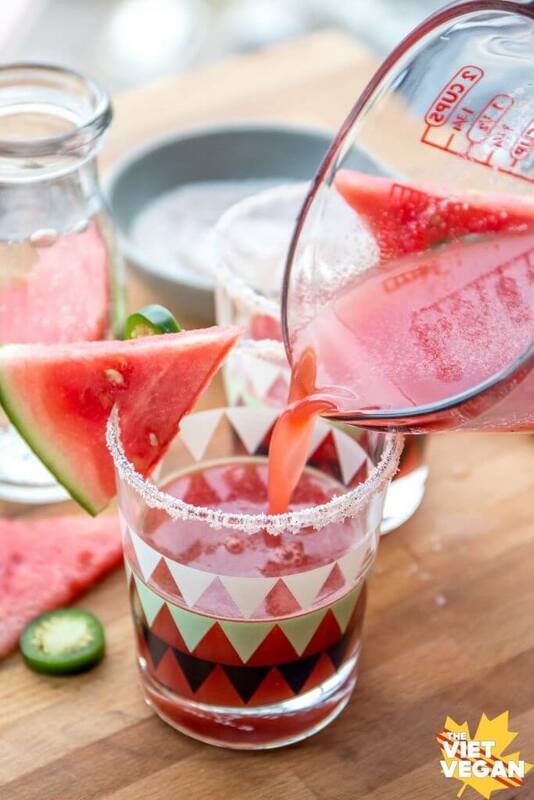 Sure people associate watermelon with the summer, but you can get watermelon all year round. A salted rim adds a frosty (and tasty) effect against the bright red bubbly, while a pop of green with jalapeño and a watermelon wedge is just another way of tying in some festive spirit. I like to spike my drinks with a little spicy kick and it seems a little healthier if you add a slice of fruit to it, right? 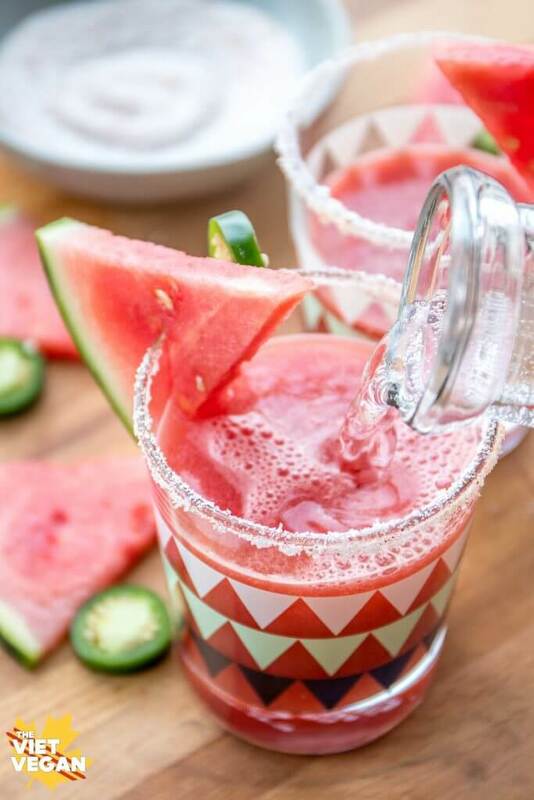 I used mini watermelons for these drinks, but there’s a hack to having them be cold without watering them down. I cubed one half and froze it, while the other half I chilled in the fridge. 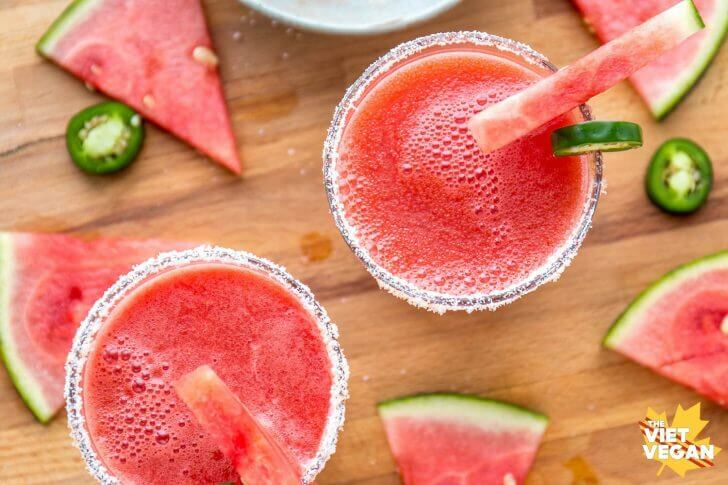 No need to water down your drinks with ice when you can freeze watermelon and blend them instead. Add some lime juice, jalapeño, blend then strain. Sweeten to taste and top it with a little bubbly water so you can feel fancy too ;) Eggnog and hot toddy’s are great and all, but I like making something that stands out. Being different is more memorable—and I don’t like to leave anyone feeling left out or forgotten. 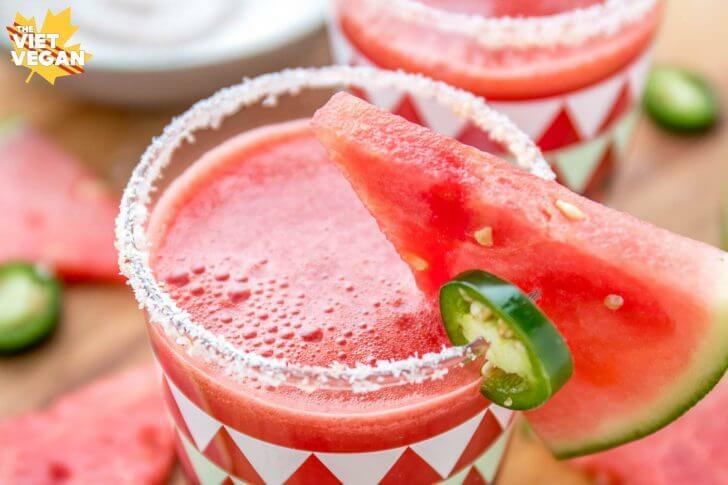 In a blender, combine frozen and fresh watermelon and half the jalapeno. Blend until you don't see any jalapeño left. Strain mixture and discard pulp. Add lime juice and simple syrup and stir to combine. To make the salted rims, combine salt and cayenne powder in a wide flat bowl. Use a wedge of lime and run it around the edge of the glass, then dip the wet edges into the spicy salt. Pour glasses 2/3 full with mixture then top off with sparkling water. 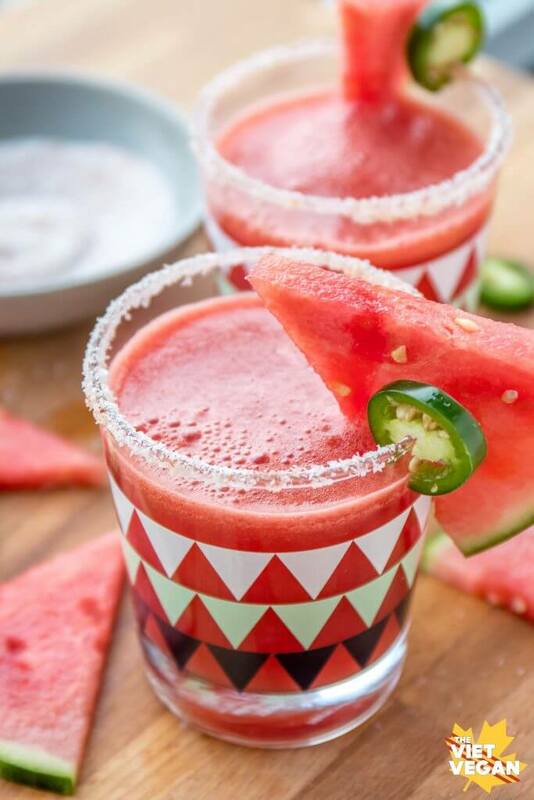 Garnish with a jalapeño coin and watermelon wedge and serve!